Hello readers! This is a blog from December 24, 2012. 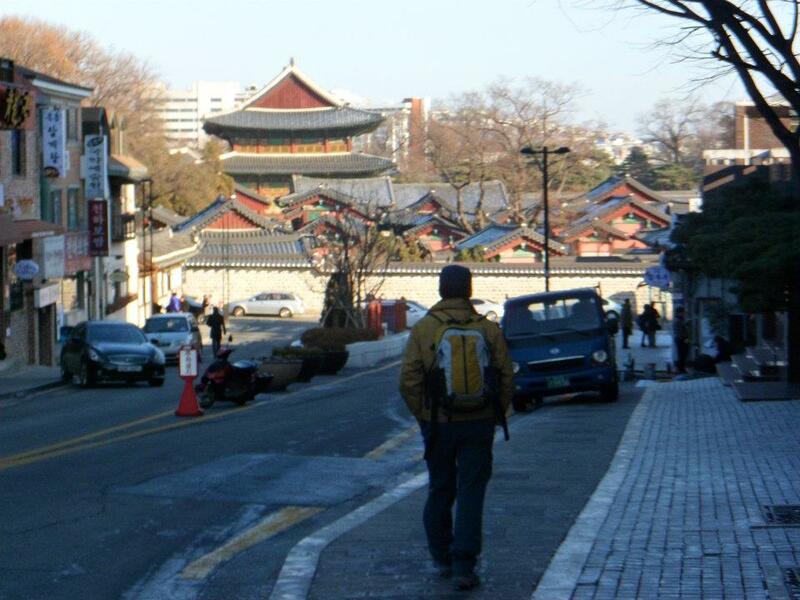 It was originally posted on my old site, “Adventures of the Seoul.” I decided to repost it on Grits and Rice to give viewers an idea of what it is like to venture out as a newbie in a foreign country. I had only been in Korea about a month at the time this story was written. I had not really made any friends, I did not have a cell phone, and I had never really been out on my own. A lot has changed since then, so it was interesting to see what my perspectives were like in the beginning. I was feeling a tad bit restless, and I was in need of some sort of adventure to distract me from being homesick during the holidays. I went on facebook and a particular post in “Meet up Korea” suddenly struck me. 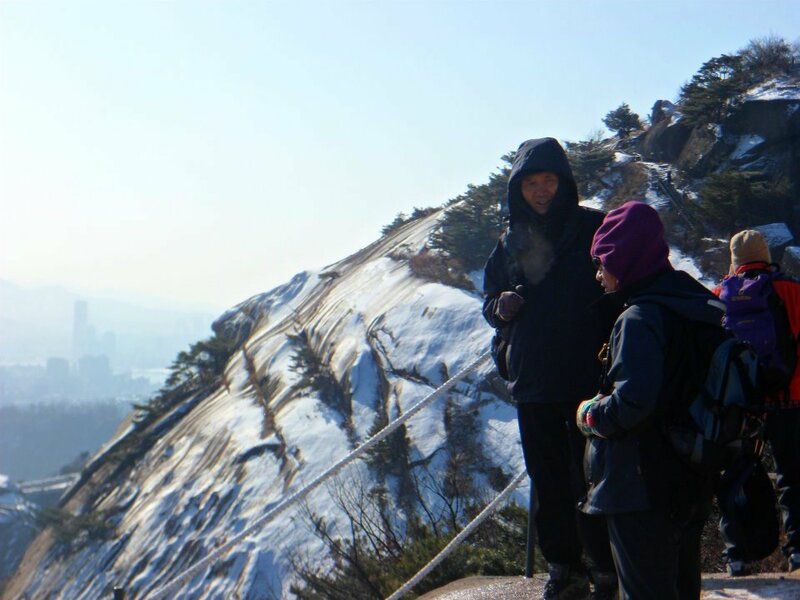 The post advertised a Christmas Eve hike to Mount Inwangsan. I figured the trip would be fully booked, so I e-mailed the group administrator, and to my luck there were spots available. I looked at the forecast, and the weather channel predicted snow throughout the night, but a clear and beautiful Christmas Eve day. It had not snowed yet since I arrived in Korea, so I was pretty excited to get an almost white Christmas. I was a little apprehensive about doing this hike alone, so I invited the only people I knew, my coworkers. Unfortunately, I was the only one with adequate hiking gear, so nobody was interested in joining me. However, after long consideration, I decided it was time for me to finally do something by myself. I woke up early and took the subway to Hongje station. I was still not used to riding the subway on my own, so I made sure to give my self time to study the map inside the station. Hopefully I will get a phone turned on soon, so I can use the nifty subway apps everyone has on their phones. When I arrived I expected to see a crew of people decked out in hiking gear, but I did not see anyone who fit the mold. A sudden feeling of panic began to rise up inside of me. I was thinking, “great, I woke up for nothing . . . I am probably at the wrong station”. Again, a cellphone would have come in handy as it was impossible to call the group to wait for me. I was just about to give up ,when all of the sudden, I saw another foreigner who looked like he was ready for a hike. I asked him if he was doing the Inwangsan hike, and to my relief he was! His name was Michael (he is the man in the red jacket in my photo). 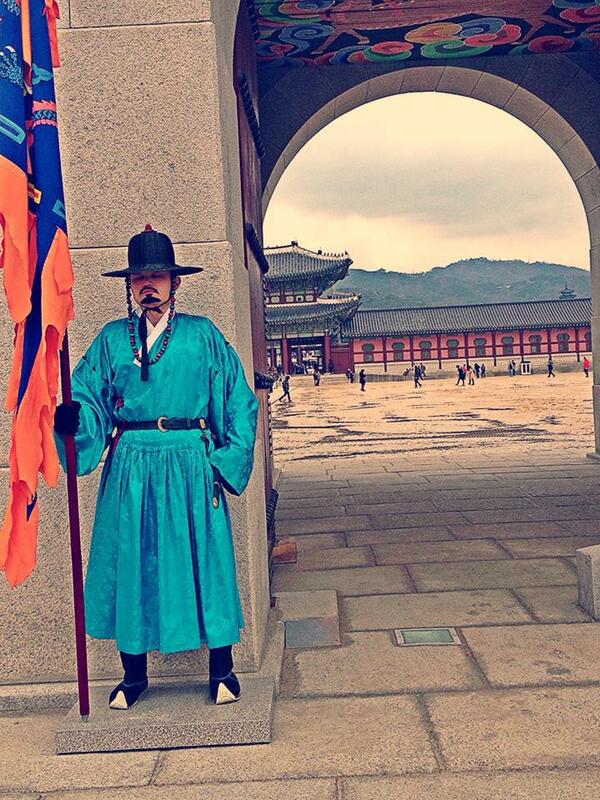 He told me our guide, Changdae, was on his way. I was relived that I had succeeded in finding our crew. After Changdae arrived we took off on our adventure. I figured more people would show up, but only the two people had signed up due to the snowy forecast. The hike started with what seemed like an endless flight of stairs. I quickly was out of breath, and became worried that I was in over my head. I am not in the best shape, and I am from the flatlands of coastal Georgia and South Carolina, so I would not call myself an avid hiker. I thought my one-time-a-year hiking trips would count as enough experience. However, I quickly realized this hike was going to be a challenge. I took a deep breath, put an awkward smile on my face, and continued to trudge along. Finally, we arrived at the first landing! I was very happy to take a short break. As I gulped down my water, a bright green and blue hula hoop caught my eye. I know this may sound silly, but this made me super excited. Back home, I am an avid hula hooper and can even spin hoops with fire. It has been a big part of my life that I have had to put on hold since moving to Korea. Due to the lack of space, and the super cold weather, I have not really been able to practice my favorite hobby. I literally began to laugh out loud to myself. Michael and Changdae seemed puzzled by my amusement. I explained to them about my obsession with hula hooping. Both of my new hiking buddies gave me a bewildered stare, then Changdae told me to give it a whirl. I don’t think either of them expected a hoop performance, but they seemed to enjoy the randomness of our finding. Afterwards even Changdae decided to give the hoop a try! My First Time Hula Hooping in the Snow! As we continued to climb on, I realized that hiking in snow was more difficult than I had anticipated. I did not have crampons, which I learned are traction devices that attach to your shoes which improve mobility in snow and ice. My only hiking experience had been summer time climbing on the gentle slopes of the North Carolina, Appalachian Mountains. I was not used to snow and ice, and on top of that there were narrow rock surfaces where we had to use ropes for hoisting ourselves up. I fell a few times, but I did not let that break my spirit. I could tell the leader was a little nervous as we approached the top, but I assured him I would be fine. Changdae was an amazing guide. Not only did he help me up, as we approached the mountain’s peak, but he also took a lot of time to explain all the different views. I knew that Seoul was a huge city, but reality really sets in when you have a panoramic perspective. 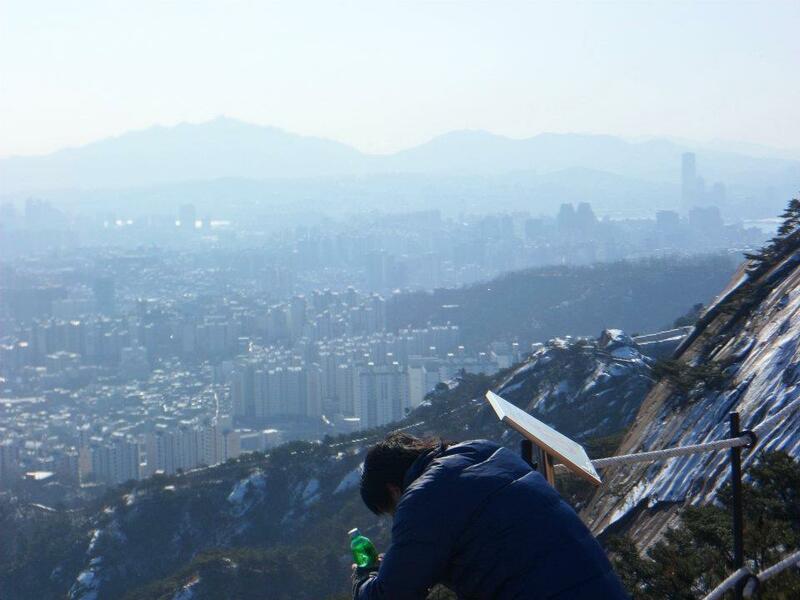 Mount Inwangsan is in the western region of Seoul, but there is still a city scape in all directions from the mountain. The actual beauty of the snow-covered landscape mixed with Seoul’s vast metropolis was difficult to capture with my little point and shoot camera. However, I was glad to have this experience, as it made me excited with anticipation that the places below were waiting for me to discover and explore them. Originally this hike was supposed to cost 10,000 won (about $10.00), but since there were only three of US, Changdae refused to take any payment from me. 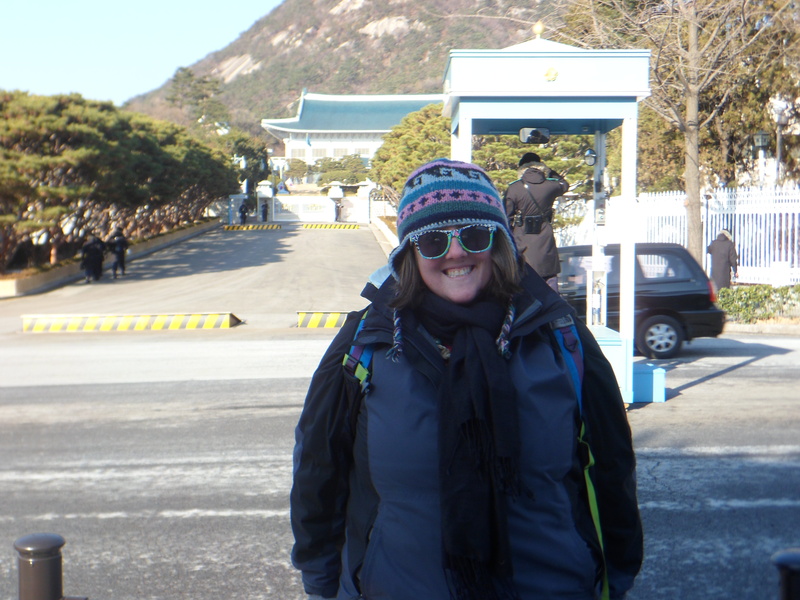 Not only did Changdae not charge us for the hike, but he even took the time to take us to the presidents house and to a palace after the hike. In Korea the president’s quarters are called “The Blue House.” I found it a little funny with the parallel to the USA’s white house. I guess I figured they would call it something more original. The Blue House is located in Samcheong-dong/Bukchon. This area of town is one of my favorite districts I have found so far. As you walk around, many of the houses are of traditional Korean architecture. The traditional homes are surrounded by art galleries, boutique style shops, museums, amazing restaurants, and the Geyongbokgong and Changdeokgung palaces. Also, this area is right at the edge of Mount Inwangsan, so the mountainous backdrop is also very stunning. Inside this entrance of the Gyeongbokgung Palace is the National Folk Museum. It was free to enter and had many interesting exhibits. 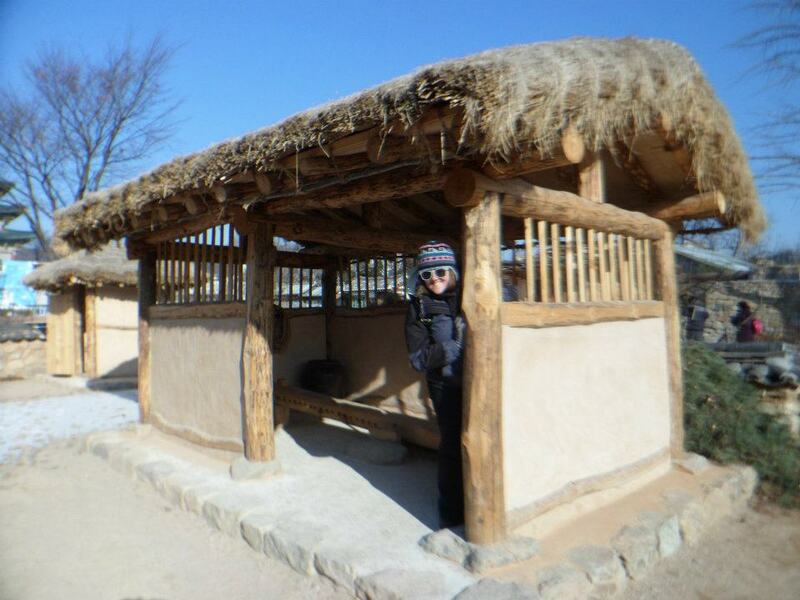 I enjoyed seeing the traditional methods of preparing kimchi as well as what the Korean home looked like in the past. 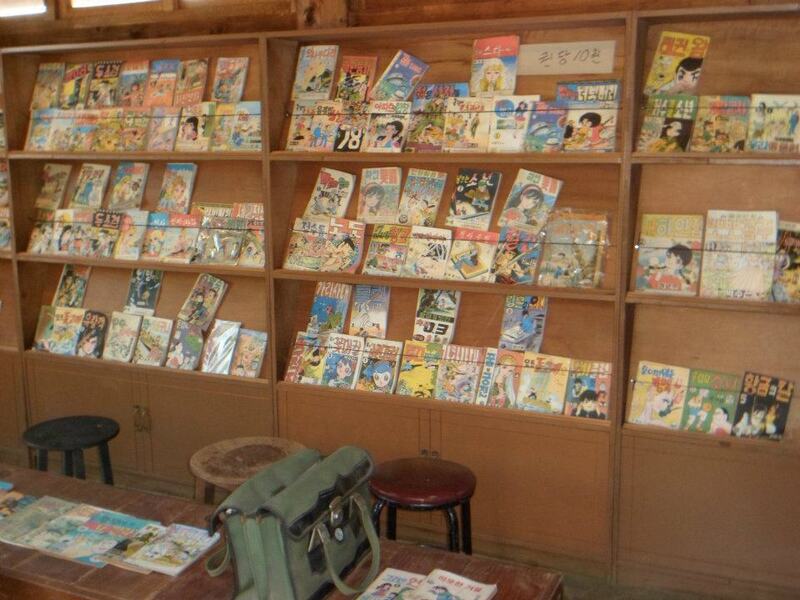 As we walked further, the museum also displayed early 20th century fashion as well as popular items such as comic books. My Christmas Eve adventure ended by having tea with my new friend Michael at a quaint little tea shop near the Anguk subway exit. It was such a wonderful way to wind down and relax after a full day of exploring. 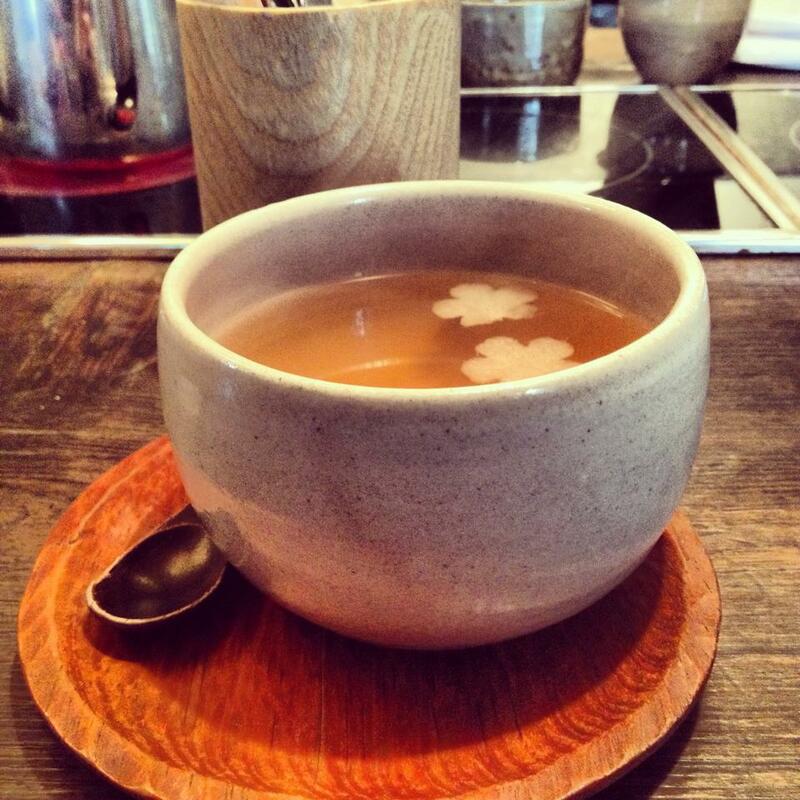 One of my goals being in Korea, is to take the time to do things on my own. I am a very extroverted person, who is used to having constant social interaction. I have rarely ever done things on my own. Even grocery shopping trips at home were usually done with my roommates or friends. It is a little uncomfortable being alone here in Korea, however I am ready to embrace this feeling in a positive light. I feel that I am entering a time where introspection is necessary in order for me to figure things out. I am glad I took this little hiking adventure. It was scary at first, but I already feel more confident in these unknown surrounding. Thanks for reading, and I look forward to sharing many more of my Korean adventures!